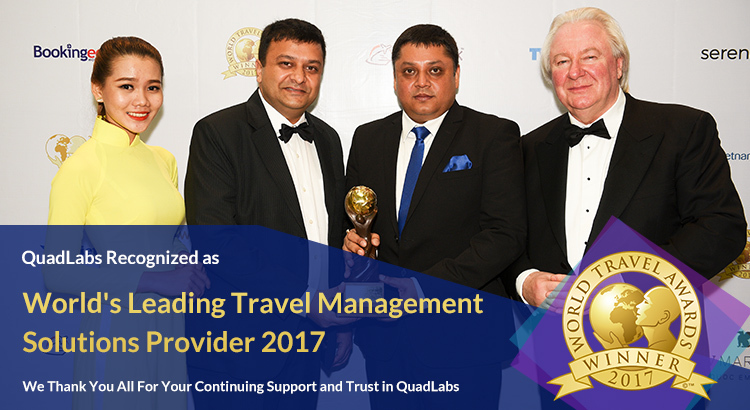 QuadLabs Technologies world leader in Travel Technology, emerged as the winner of the ‘World’s Leading Travel Management Solutions Provider 2017’ by World Travel Awards. The honour was unveiled in the prestigious ceremony held at JW Marriott Phu Quoc Emerald Bay, Vietnam on Sunday, 10th December, 2017. World Travel Awards celebrates its 24th anniversary year in 2017. It is the most prominent fraternity recognizing and rewarding the excellence across all key sectors of the travel tourism ; hospitality industry. It invites over 650,000 individual votes from travel professionals and high-end tourism consumers. QuadLabs has continuously distinguished itself by focusing on delivering world-class Technology products to the travel industry. Their products have significantly contributed in improving the business processes, optimizing revenue stream and enhance customer service experience. With over 90 midsize to large scale esteemed customers spread across 26 countries which include Asia, Middle East, Latin America, Europe and Africa. For the past 11 years XChange ERP platform has evolved adding new features and functionalities to improve and adapt changes based on specific geographies benefitting the global travel enterprises. QuadLabs continuing with its winning streak by awarded/recognized as Middle East’s Leading Travel ERP Technology Provider third time in a row at World Travel Awards. QuadLabs Technologies, announced that it has been recognized by the World Travel Awards, most prominent fraternity recognizing and rewarding the excellence across all key sectors of the travel tourism as a ‘Middle East’s Leading Travel ERP Technology Provider’. The honour was unveiled in the prestigious ceremony held at Armani Hotel Dubai, United Arab Emirates on Sunday, 29th October 2017. Being world leader in travel technology, has been recognized for three consecutive years shows a consistent growth in their technology offering and the trust from the customers ; Partners. “Third year in a row is a source of great pride to our firm. It recognizes our dedication and effort to create the best possible travel technology solution and highest level of service for our esteemed customers.” said Mr. Gaurav Chiripal, CEO of QuadLabs Technologies. © Copyright 2019 by QuadLabs Technologies Pvt. Ltd.